Everything else. The location is superb as it is a 15 min. drive to the center of Reykjavik. The apartment was truly like a home for the 8 days we were there. Comfortable, beautiful view of the lake and of Kópavogur, the bedding is so comfy and nice. The "king" bed only fits two people as it has a wedge straight down the middle. We were a family of 3, two adults and an 8 yr old child. For more than 3 people it would be cramped but for our situation it was perfect. The kitchinette was great to have, very convenient for breakfast and late night snacks. The room has a coffeemaker, kettle, mini fridge, microwave and dishwasher. The wifi works without fail. We had 4 devices connected and not once did any of our devices stop streaming. The building is very clean and quiet. Every night was a good night's sleep. It was home away from home. The most comfortable bed, pillows and duvet. Grocery store across the road and lots of parking. I liked the cleanliness, the quiet,a bakery and market nearby. 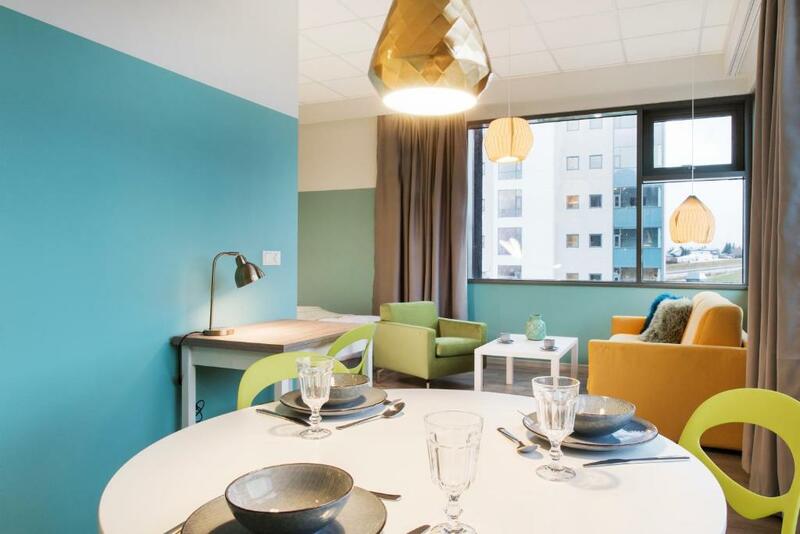 New quiet apartments close to road to airport as well as restaurants in center of Reykjavík. 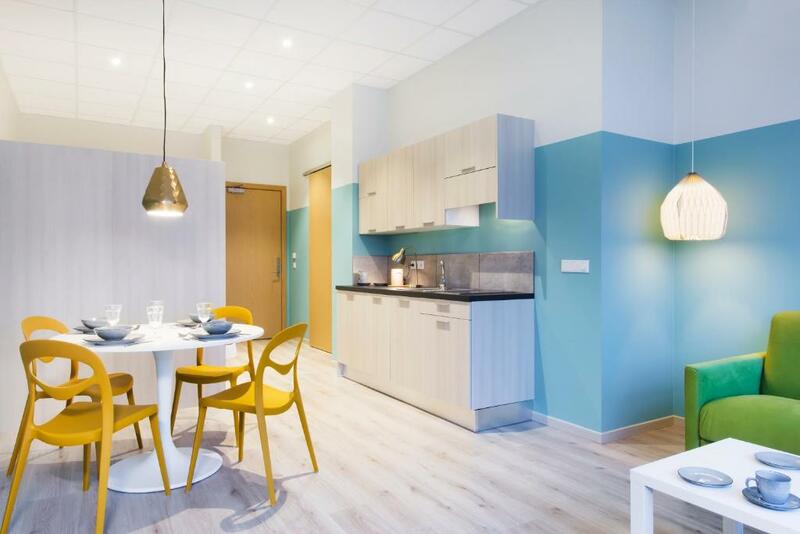 Easy parking, free wifi and small kitchen. The apartment was clean and comfortable. The location was perfect, we did not spend much time in Reykjavík, but rented a car and headed out every morning. The apartments are also quite, never heard any neighbors. The size of the room was perfect for two people. Everything was perfectly clean and the room felt like a home away from home. The pillows were super comfy and there were lots of plug sockets to charge various devices overnight. The beds were very comfortable and the kitchen was stocked with all the essentials. We arrived very tired, early in the morning and our room was available prior to 3:00 p.m. 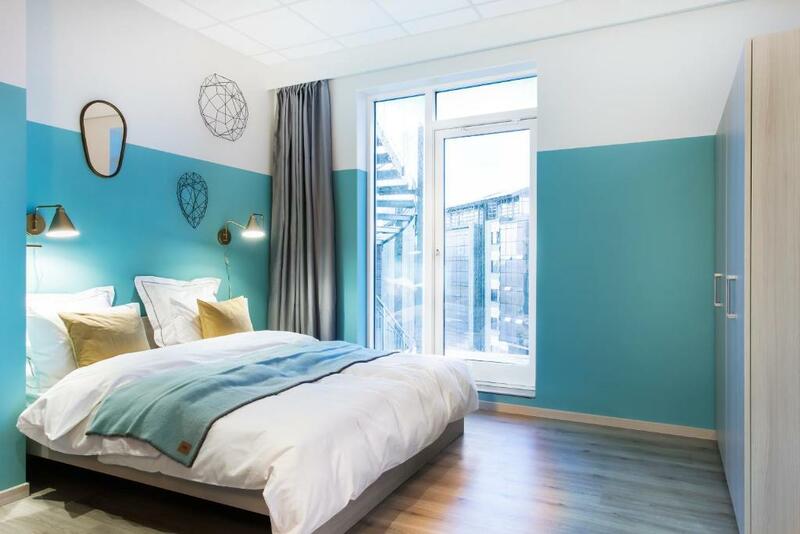 Lock in a great price for Icelandic Apartments – rated 8.9 by recent guests! Icelandic Apartments This rating is a reflection of how the property compares to the industry standard when it comes to price, facilities and services available. It's based on a self-evaluation by the property. Use this rating to help choose your stay! 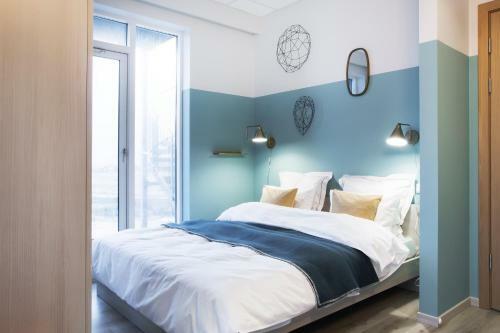 Located in Kópavogur within 0.7 mi of Lake Ellidavatn, Icelandic Apartments provides accommodations with free WiFi, seating area and a kitchen. The Pearl is 5 mi away, while Reykjavik City Center is 6.2 mi away. Fitted with a balcony, the units feature a flat-screen TV and a private bathroom with bath or shower. A dishwasher, a microwave and fridge are also featured, as well as a kettle. Smáralind Shopping Center is 2.4 mi from the aparthotel. Bessastaðir, the President of Iceland's residence, is 8.1 mi away from Icelandic Apartments. Keflavik International Airport is 30 mi away. 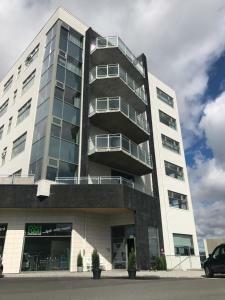 When would you like to stay at Icelandic Apartments? 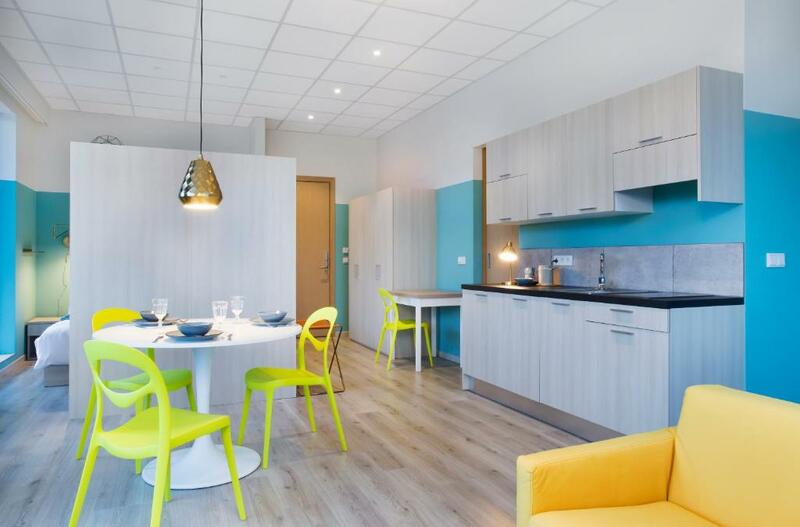 This brightly decorated studio features a city view, full kitchen and balcony. This brightly decorated studio features a sofa and tea/coffee facilities. This studio has a tea/coffee maker, electric kettle and oven. Featuring a panoramic view, this apartment comes with a full kitchen, satellite TV and free toiletries. House Rules Icelandic Apartments takes special requests – add in the next step! Icelandic Apartments accepts these cards and reserves the right to temporarily hold an amount prior to arrival. Please inform Icelandic Apartments of your expected arrival time in advance. You can use the Special Requests box when booking, or contact the property directly using the contact details in your confirmation. Bonus Supermarket just down the road. Very easy check in and check out. Poor drainage in the shower area. Smells of sulfur when using warm water from the tap. Location, fantastic view from the room & ample parking. View is good! Room is quite clean. Kitchen facilities are well prepared. We had two casual nights here. Everything is great. We will visit again. Over expected. complete furnishings and more we liked the dishwasher very much. Close to several supermarkets, including one open 24 hours a day, very useful if you arrive in the evening. I felt it was a little overpriced for what it was. The bed was really weird and had been stuck together but there was a big mound all the way down the middle. The view was incredible from the 6th floor. 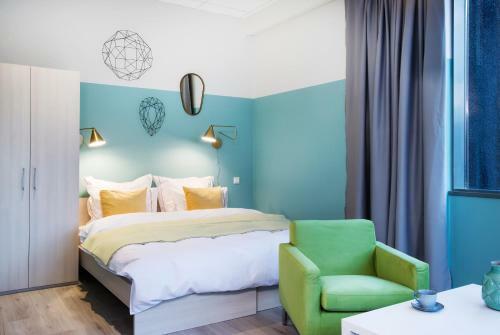 Definitely get the mountain view room, you wont be disappointed! Amazing apartment, wonderful view. Very quiet, good location, comfortable bed. All in all, very happy to go back there after a long day exploring Iceland. Could do with an oven or grill to make life a bit easier, but we coped with the hob and microwave. Would definitely go back. The kitchen facilities is good and the market is very closely to the hotel. It is right that the staff girl told us the most exciting view is the mountains around. In the morning we stand in front of the window enjoyed the wonderful view even we cannot say goodbye. I asked for the room to be cleaned after the 4th day of our stay. I made the request in person and was told it would be done by the time we got back from our day out. Long story short the room was not serviced once. We had to ask for more tp and fresh towels. This is really not a dislike but more of a suggestion - it would have been useful to have a combi oven rather than just a microwave to give more cooking choice. The lay out of the room, the fact it had a comfortable sofa bed ( sharing the room with my son so meant we could have a bed each). The apartment worked really well for us as we could shop at the supermarket over the road, cook and eat in the apartment.